Everybody knows Americans consume obscene amounts of food and also throw away ridiculous quantities of scraps every day. With all these scraps of nutrients and leftovers going to waste, wouldn’t you think that by now, in the year 2012, we’d have figured out a better use for them? That’s where Dan Blake, CEO of composting soil startup EcoScraps comes in. About two years ago, he decided he wanted to start a business off of collecting food waste and turning it into something useful. After realizing how much food he had thrown away at an all-you-can eat buffet, Blake realized there was a business model to be had from leftover food. 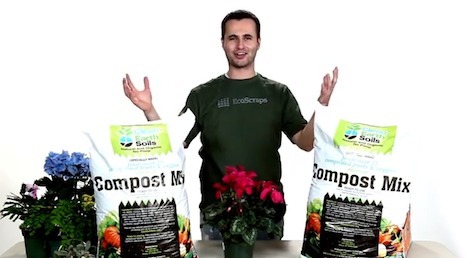 A call to Costco got him a pilot program where he took all the stores leftovers, turned them into compost, and sold it back to Costco to sell in the gardening department. Now, two years later, the company announced it has raised about $1.5 million in venture capital from Kickstart, DBL Investors, and Peterson Partners. The current composting method takes less than a month, which is pretty swift in comparison to the three to six month standard for other facilities. Once the process is complete, the mix is packaged up and sold at home repair and gardening retailers. According to Blake, current revenues for EcoScraps are three times higher than they were just a year ago, with at least 200 Home Depot stores selling the mix. The three facilities in California, Arizona, and Utah are composting more than 100 tons of food waste every day. The venture funding is geared toward 2013 efforts, when Blake plans to move EcoScraps beyond the West Coast, across the United States. The plan is to open compost mix facilities in New Mexico, Texas, up the east coast, and across the south and southwestern regions. The company tagline is “no chemicals, no poop.” It doesn’t get more appealing than that, does it? This product tackles several problems we’re currently facing. It turns waste into a useful product, provides a healthier alternative to chemical fertilizers, and protects the Earth from rotting food building up in landfills. If EcoScraps is sold in your area, would you give it a try?